In fact, if truth be known, the holiday of Christmas has always been more Pagan than Christian, with its associations of Nordic divination, Celtic fertility rites, and Roman Mithraism. That is why both Martin Luther and John Calvin abhorred it, why the Puritans refused to acknowledge it, much less celebrate it (to them, no day of the year could be more holy than the Sabbath), and why it was even made ILLEGAL in Boston! The holiday was already too closely associated with the birth of older Pagan gods and heroes. And many of them (like Oedipus, Theseus, Hercules, Perseus, Jason, Dionysus, Apollo, Mithra, Horus and even Arthur) possessed a narrative of birth, death, and resurrection that was uncomfortably close to that of Jesus. And to make matters worse, many of them pre-dated the Christian Savior. That is why Pagans have as much right to claim this holiday as Christians. Perhaps even more so, as the Christians were rather late in laying claim to it, and tried more than once to reject it. There had been a tradition in the West that Mary bore the child Jesus on the twenty-fifth day, but no one could seem to decide on the month. Finally, in 320 C.E., the Catholic Fathers in Rome decided to make it December, in an effort to co-opt the Mithraic celebration of the Romans and the Yule celebrations of the Celts and Saxons. There was never much pretense that the date they finally chose was historically accurate. Shepherds just don't 'tend their flocks by night' in the high pastures in the dead of winter! But if one wishes to use the New Testament as historical evidence, this reference may point to sometime in the spring as the time of Jesus's birth. This is because the lambing season occurs in the spring and that is the only time when shepherds are likely to 'watch their flocks by night' – to make sure the lambing goes well. Knowing this, the Eastern half of the Church continued to reject December 25, preferring a 'movable date' fixed by their astrologers according to the moon. Of course, the Christian version of the holiday spread to many countries no faster than Christianity itself, which means that 'Christmas' wasn't celebrated in Ireland until the late fifth century; in England, Switzerland, and Austria until the seventh; in Germany until the eighth; and in the Slavic lands until the ninth and tenth. Not that these countries lacked their own mid-winter celebrations of Yuletide. Long before the world had heard of Jesus, Pagans had been observing the season by bringing in the Yule log, wishing on it, and lighting it from the remains of last year's log. Riddles were posed and answered, magic and rituals were practiced, wild boars were sacrificed and consumed along with large quantities of liquor, corn dollies were carried from house to house while carolling, fertility rites were practiced (girls standing under a sprig of mistletoe were subject to a bit more than a kiss), and divinations were cast for the coming Spring. Many of these Pagan customs, in an appropriately watered-down form, have entered the mainstream of Christian celebration, though most celebrants do not realize (or do not mention it, if they do) their origins. 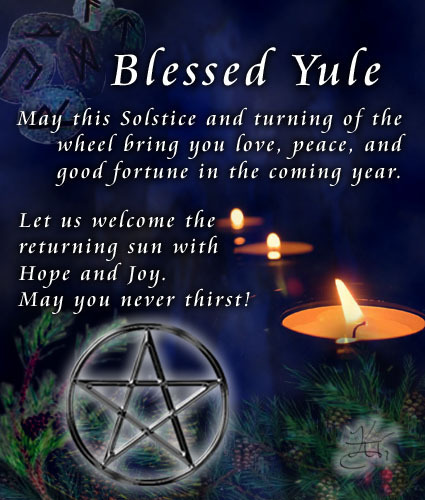 For modern Witches, Yule (from the Anglo-Saxon 'Yula', meaning 'wheel' of the year) is usually celebrated on the actual Winter Solstice, which may vary by a few days, though it usually occurs on or around December 21st. It is a Lesser Sabbat or Lower Holiday in the modern Pagan calendar, one of the four quarter-days of the year, but a very important one. Pagan customs are still enthusiastically followed. Once, the Yule log had been the center of the celebration. It was lighted on the eve of the solstice (it should light on the first try) and must be kept burning for twelve hours, for good luck. It should be made of ash. Later, the Yule log was replaced by the Yule tree but, instead of burning it, burning candles were placed on it. In Christianity, Protestants might claim that Martin Luther invented the custom, and Catholics might grant St. Boniface the honor, but the custom can demonstrably be traced back through the Roman Saturnalia all the way to ancient Egypt. Needless to say, such a tree should be cut down rather than purchased, and should be disposed of by burning, the proper way to dispatch any sacred object. Along with the evergreen, the holly and the ivy and the mistletoe were important plants of the season, all symbolizing fertility and everlasting life. Mistletoe was especially venerated by the Celtic Druids, who cut it with a golden sickle on the sixth night of the moon, and believed it to be an aphrodisiac. (Magically – not medicinally! It's highly toxic!) But aphrodisiacs must have been the smallest part of the Yuletide menu in ancient times, as contemporary reports indicate that the tables fairly creaked under the strain of every type of good food. And drink! The most popular of which was the 'wassail cup' deriving its name from the Anglo-Saxon term 'waes hael' (be whole or hale).